To many people, static electricity is little more than the shock experienced when touching a metal doorknob after sliding across a car seat or walking a carpeted room. But in the petrochemical and gas industries workers are often exposed to explosive and flammable conditions and the danger of Static electricity. The same is valid for firemen. Other examples are vehicle paint spraying workplaces, workplaces were handling fine organic dust such as grain flour takes place. In these environments you easily have flammable atmospheres. They occur when gasses, vapours, or powders are mixed with air. Explosions can cause loss of life and serious injuries as well as significant damage. Preventing releases of dangerous substances which can create explosive atmospheres and preventing sources of ignition are two ways of reducing the risk. Using the correct equipment can help greatly in this. Therefore employers must provide their workers with appropriate clothing in order to limit electrostatic discharge and avoid a possible ignition of an explosive atmosphere. In practice there are many sources, but an important source could be the clothing people are wearing. Due to body movement and rubbing of the garment the person is wearing, fabrics can easily generate charges of 10,000 Volts and more. If this charge remains on the garment or on the human body which is in contact with the garment, then there is a serious risk that this charge will result in a spark, when the person approaches or touches a grounded object, because the ground object will allow the charged object to uncharge. By doing this a spark can be created which can be strong enough to ignite fuel, gas or powder and result in a very severe explosion. In real life this also happen to us. Many of you may have seen the movie on the internet were a women is refuelling her car. This is a good example what static electricity can do. She is not doing anything special. The only thing she does during refuelling is to step in and out of her car probably to look for something in her bag. But she is not aware that by doing this she creates friction with the car seat, which creates an electrostatic charge. Because she is probably wearing shoes with a rubber sole, the charge can not leak away to the ground when stepping out of her car. As soon as she touches the nozzle of the pump installation, the charge is able to leak away, creates a spark and makes the fuel explode. This movie is not fake, but real. And this can happen to every one of us, especially during dry conditions e.g. in thewinter time. In industrial situations these risks can be even more important. The best way to prevent electrostatic discharge is to assure that all possible sources of static build up are avoided. This means that all conductive objects need to be grounded and that the proper protective garment needs to be used. This can be done by wearing garments containing surface conductive fibres. Surface conductor fibres or filaments are made out of stainless steel, carbon, copper or silver and are conductive at the surface. This means that they are not covered or electrically insulated. As they always conduct the current at the outside of the fibre or filament, they can as such easily be connected to earth, or make direct contact with the human body to transport safely and instantaneously the current from the garment, through the body to the ground. In practice surface conductive fibres are blended during the spinning process with other traditional fibres e.g. PES or Cotton. In many cases only a limited amount of conductive fibres are needed to give the yarn sufficient conductive properties. They also do not feel uncomfortable or have a negative effect on the people wearing them. These yarns are then mainly used in a grid structure e.g. one conductive yarn every cm in both warp and weft direction in order to form a conductive grid throughout the fabric. The same yarns also make sure that when used in the seams, safe transport of electrostatic charges is guaranteed throughout the whole garment. Especially stainless steel fibres are very suitable for use in protective garments as they have superior washing characteristics. The main reason for this is that during the high-tech manufacturing process, stainless steel fibres get a unique surface structure as they are crimped in such a way that when spun, they give the yarns besides their good conductive properties, also superior washing characteristics as the fibres are locked into the yarn. The antistatic properties defined in the standard EN1149 remain after more then 200 Industrial washing cycles. Therefore personal protective clothing made with stainless steel fibres easily fulfil the international safety norms and are the preferred solution in the market, whereas carbon loaded filaments, which are also conductive, do not resist to frequent washings. As during washing the ultra thin carbon coat can crack which will result in a conductivity drop. The more they are washed, the less conductive and the less safe they will become. This is not the case for stainless steel fibre products. Some products on the market do not transport static electricity over the surface of the yarn but have a conductive carbon core and are covered with an insulating outer layer. Due to this insulating outer layer garments made of these products cannot be safely earthed. These products are called core conductors. Several manufacturers claim that garments containing core conductors yarns can be used safely even when not connected to earth. When charging by friction or rubbing takes place, the charge will remain on the garment for a certain time and will only reduce slowly by means of corona discharge. Corona discharge is a limited discharge of current into the air. The rest charge itself will not reduce to zero. But when not earthed the main thing is that protective clothing, no matter how good it is, cannot replace good earthing practices which are always required in explosive atmospheres. As it is very difficult to determine the cause of a discharge when an explosion takes place, the rule is to exclude all possible risks, so the risk to have somebody not earthed is extremely high. Because no matter what type of garment the worker is then wearing, the human body, which is a good conductor, can still produce ignitions, or induce a charge on a nearby non-earthed object. Therefore workers wearing protective clothing always need to be properly grounded. This can be done by wearing the right and proper conductive shoes. As such the charge present on the workers clothing and on the workers body, will leak away safely to ground. Luckily more and more people working in dangerous explosive atmospheres understand that all possible risk should be reduced to a minimum. Not only in Western-Europe, but also in Eastern-Europe, Russia, South-America, India and China people see the need for good legislations and standards in order to make sure that risk is kept to a minimum and that it is better for all of us to work in a safe environment wearing the right protective clothing. Besides explosive atmospheres, electrostatic discharges can also have negative effects in other industries e.g. electronic assembly industry or semiconductor industry. We all know that severe lightning strikes can damage sensitive electronic equipment and disrupt telephone service. This phenomenon is called Electrostatic Discharge or ESD. ESD is a single-event, rapid transfer of electrostatic charge between two objects, usually resulting when two objects at different potentials come into direct contact with each other. Example a person walking across a carpet can feel electrical shock when opening a door. This electrostatic charge is caused by the rubbing and separation of the shoes with the carpet. When he touches the doorknob, the charge will transfer from his body to the grounded door. Not only lightning strikes, but also small charges of e.g. 100V or even lower are in some industries e.g. semiconductor industry, the cause of many problems as they are sufficiently high to damage small electronic components. Some examples: VMOS is sensitive to 30-1800 V, MOSFET 100-200 V, CMOS 250-3000 V. These industries are called ESD sensitive environments. In these industries ESD is considered as the most important cause of damage, degradation and malfunctioning of electronic components. ESD can also result in increased fall-out, extra production stops, reduced quality, shorter life-time, higher service frequency and last but not least an unsatisfied customer. Research has shown that 40-50 % of all electronic defects are the result of ESD. One of the major causes of ESD is the clothing people are wearing. Electric charges on the clothing of operators are typically accumulated when the operator is moving around. The rubbing or separation of two different materials is again the cause. This is called tribo-electric effect. We all know it when we take off e.g. a sweater containing PES which makes our hair stand right up. In an electronics manufacturing environment specially designed protective clothing is often used to minimise accumulation and retention of charge. This clothing, also called ESD garments, is worn over the ordinary clothing of the operator. In some cases ESD garments are not used to prevent ESD damage to electronics, but also to prevent the electronics being damaged by the contamination of dust particles (cleanroom clothing). But the main purpose of ESD garments is to minimise the risk of ESD failures to sensitive electronics due to charged clothing. When looking at the electronic equipment we more frequently use in our daily lives, we can clearly see that they are become smaller and smaller. The parts of which they are made have become smaller too with increased complexity and functionality. As a result the electronic components have become more sensitive to electrical currents. The reason is that most of the devices are susceptible to the energy of the discharge. Energy susceptible devices fail by the high discharge current heating a small volume of material to a failure temperature. The failure temperature is often the melting temperature of the material. How can we avoid the human body or garments of the people who assemble electronic components generating these small currents, knowing that a person walking over a carpet can easily generate 30 kV? The solution is wearing a ESD jacket with the right conductivity. This jacket has to make sure that all charges can leak away safely to earth. How does it work? Well an ESD jacket works as a reverse Faraday Cage. The charges are caught by the conductive structure present in the ESD garment fabric. To make this work the ESD jacket needs to have a certain conductivity, needs to make contact with skin and needs to cover all clothing, according to standard IEC 61340-5-1. Besides the conductive jacket the worker also needs to be connected to earth because the backbone of static generation reduction and static dissipation is proper grounding of everything a device touches. The primary means of grounding ESD susceptible items e.g. personnel, equipment, workstations etc. is to provide electrically conductive parts between these items and a common ground. This means that every factory needs to have a common grounding point. Connecting everything to a common grounding point essentially puts everything at the same potential. As long as everything is in equipotential balance, charging and discharging events will be prevented. It is important to note that insulators e.g. ESD garments based on core conductor yarns must be avoided in EPAs as much as possible. An EPA or ESD Protected Area, is an area where ESD-sensitive devices will be handled. As quite often important rest charges remain present on the core conductor garment, big enough to induce a charge on electronic components even without making contact. This phenomenon is called charge transfer by induction. This charge could damage the component which results in important fallout of the component, or of the electronic equipment in which the component is built. Therefore in ESD environments it is extremely important to wear the right garments based on stainless steel surface conductive fibres which can be perfectly earthed. Besides ESD garments, stainless steel fibres and yarns can also be used for other applications to allow safe transport and discharge of static electricity e.g. in floor coverings (airplane carpets, computer rooms, call centres), upholstery fabrics, brushes, or in areas were electromagnetic shielding is an issue, e.g. 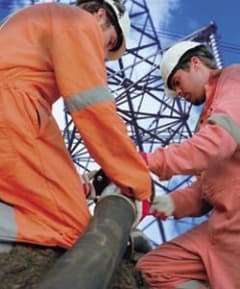 in high voltage line suits. Stainless steel multifilament yarns have a higher conductivity then stainless steel fibre products and can as such be used for heating of outdoor wear, sport wear, heating blankets etc. They guarantee a safe and comfortable heating.